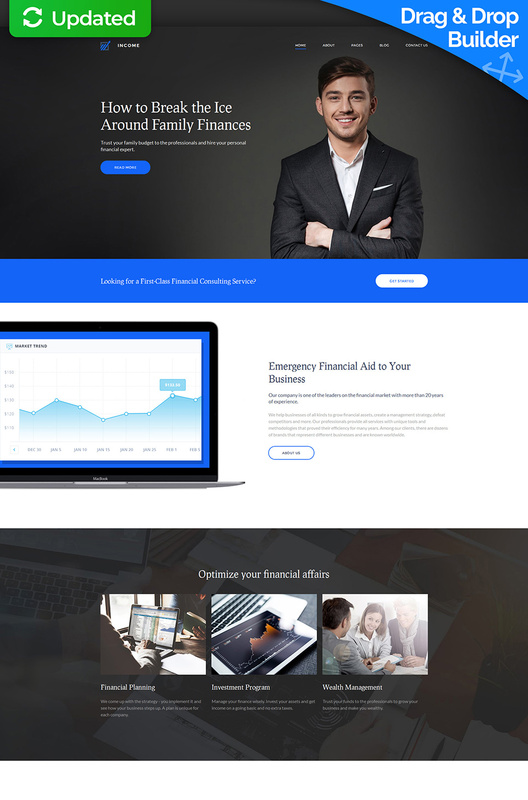 Income is a modern, easy-to-use and resourceful financial website template perfectly suited for businesses like loan company, banking system, advisor agency etc. So whether you want to update an old website of your already established company or just starting up in the industry, Income will certainly help you present your business online in the best way possible. Income is extremely easy to set up — no coding or programming knowledge is required and all you have to do is install the template and customize it according to your needs and tastes. Simply drag-and-drop design elements, replace dummy content with your own and apply your branding colors with the help of handy color picker. With Income's 100% responsive interface and a powerful SEO tool integrated into the theme, be sure your website will get maximum performance and attract your target audience easily and quickly. Sprzedano - 32 szt. tego szablonu.